Also known as Carpenter 20 and 20CB-3, Alloy 20 blind flanges offer users a combination of nickel, chromium, molybdenum, and copper which provides good general corrosion resistance. Alloy 20 blind flanges are best suited for mid-range corrosion use – better than steel alloys but not at the level of high performance nickel based alloys like Hastelloy C276. Alloy 20 is a nickel alloy that was initially designed to withstand the harsh environment of hot sulfuric acid but also performs well in a variety of other acids. Alloy 20 blind flanges are an ideal choice when you don’t need the corrosion resistance power and price-tag of high performance nickel alloys like Hastelloy C276; but you need something that will give you more protection than 316 stainless steel or even a Super Duplex 2507 stainless steel. Alloy 20 blind flanges provide good performance in hot sulfuric acid, specifically they offer good resistance to stress-corrosion cracking in boiling sulfuric acid at specific range of 20% to 40% concentration, as well as general sulfuric acid resistance. 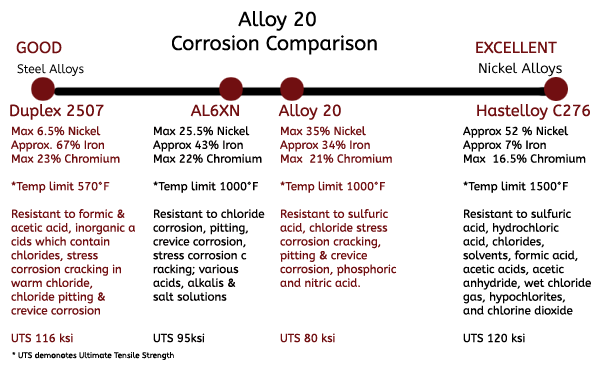 Alloy 20 offers solid acid protection and will perform better than Duplex or even Monel, but for high temperature and high concentration acids, you may need to look to Inconel or Hastelloy fasteners. In addition, Alloy 20 blind flanges also show useful resistance to phosphoric acid and nitric acid. In addition to their corrosion resistance, Alloy 20 blind flanges also perform well at moderately high temperatures, with the ability to maintain their mechanical strength up to 1000°F. Alloy 20 blind flanges are stabilized with Columbium to minimize carbide precipitation during welding. 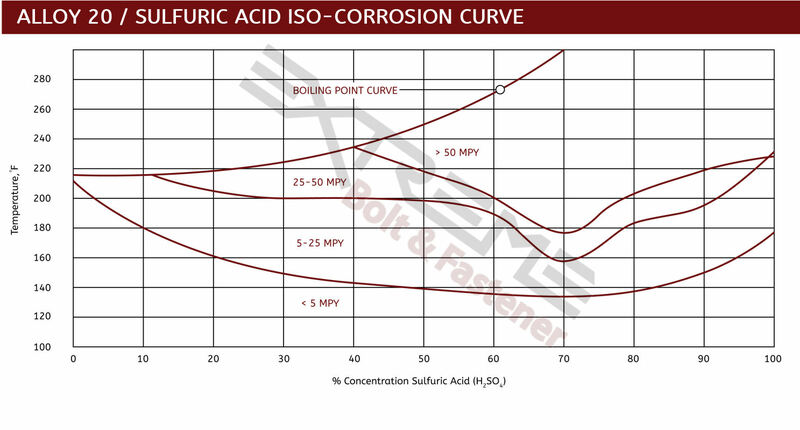 In addition it offers intergranular corrosion resistance in the as-welded condition. • Alloy 20 blind flanges are used to connect heat exchangers, mixing tanks, metal cleaning equipment, pickling tanks and racks, and piping in mid-range corrosive chemcial processing environments. • Alloy 20 blind flanges help solve corrosion issues in food and dye production.